With the aid of Federal and State governments, cities and counties in all parts of the country are developing their local civil defense systems--the fallout shelters, supporting equipment and emergency plans needed to reduce the loss of life from an enemy attack. 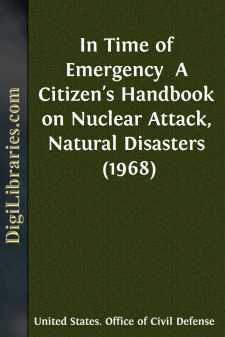 This handbook, "In Time of Emergency," contains basic general information on both nuclear attack and major natural disasters. This general guidance supplements the specific instructions issued by local governments. Since special conditions may exist in some communities, the local instructions may be slightly different from this general guidance. In those cases, the local instructions should be followed. Part I (pages -) is concerned with nuclear attack and basic actions to take. Part II (pages -) discusses preparations and emergency actions that will help individuals cope with major natural disasters--floods, hurricanes, tornadoes, winter storms, and earthquakes. "PERSONAL AND FAMILY SURVIVAL" (12-hour course)--A basic orientation course in civil defense, which also tells people how to improve their protection against the effects of a nuclear attack. "MEDICAL SELF-HELP" (16-hour course)--How to care for the sick and injured if a doctor or nurse is not available. "FIRST AID" (courses of various lengths)--How to help the sick and injured until professional medical assistance is obtained. "CARE OF THE SICK AND INJURED" (12-hour course)--How to care for patients after they have received professional medical treatment. If an enemy should threaten to attack the United States, you would not be alone. The entire Nation would be mobilizing to repulse the attack, destroy the enemy, and hold down our own loss of life. Much assistance would be available to you--from local, State and Federal governments, from the U.S. armed forces units in your area, and from your neighbors and fellow-Americans. If an attack should come, many lives would be saved through effective emergency preparations and actions.